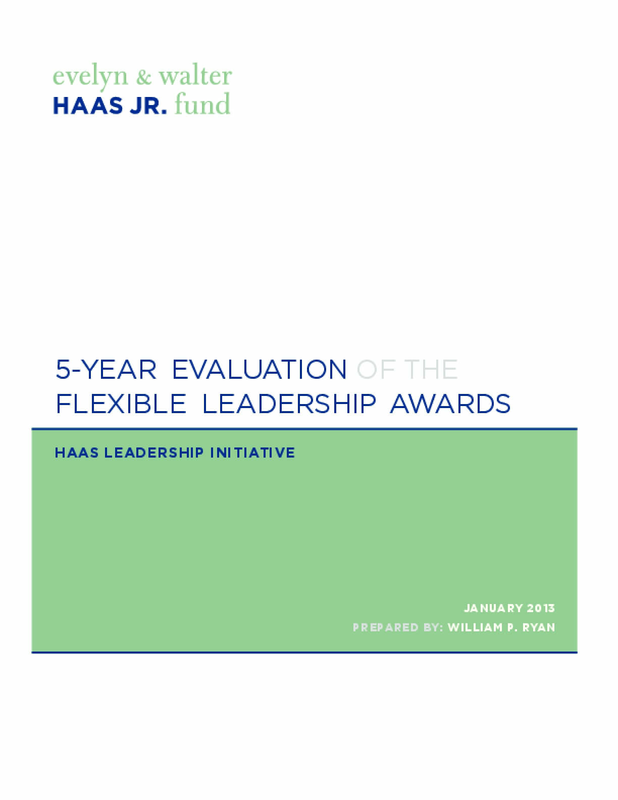 This report presents findings and analysis from an evaluation of the Flexible Leadership Awards ("FLA") program ("the Program"). As the Program's sponsor, the Evelyn and Walter Haas, Jr. Fund ("the Fund") commissioned the evaluation both to inform its own work and to contribute to the ongoing dialogue about how foundations can best support their grantees' leadership development. The report has three sections:An overview of the Fund's approach to learning and evaluation, which provides context for this report.A review of grantees' progress, which assesses how the organizations fared in meeting the leadership development and mission advancing goals they had set at the outsetof the Program; and explores how FLA contributed to grantees' gains.An account of how the Program worked, which presents a detailed description of key elements of the Program's design, as well as lessons learned during implementation that may benefit other funders considering investing in leadership development. Copyright 2013 by Evelyn & Walter Haas, Jr. Fund. All rights reserved.